Paul Turbitt: artist, architect and bricoleur of the bush | Daily Review: Film, stage and music reviews, interviews and more. There are artists who explore concepts, hint at ideas, privilege ways of seeing, delve, conjure, reveal, dialogue and, of course, play… lots of play. Read artist statements or critics’ reviews, and it can seem like art is a game stacked against the viewer. There’s plenty of playfulness in what Paul Turbitt creates, but it doesn’t feel like a game. 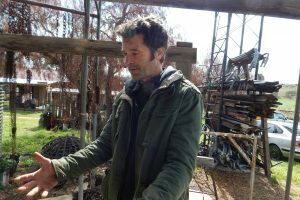 His studio is 20 acres of hard, open land wedged against a ridge of granite at the edge of the Central Victorian goldfields belt. Shearing sheds and slurry dumps are now part of a landscape someone with an English-garden sensibility may well call nightmarish. For others, those with a collector’s sensibilities, it’s paradise. Trained in Adelaide as an architect, and with engineering experience, Turbitt makes sculpture. The first thing a visitor sees when turning off the Midland Highway between Castlemaine and Daylesford is a sign on a fence: SING. If you choose to obey, make it something hearty and joyful. Turbitt territory demands you arrive ready to have your spirit lifted. Everything Turbitt creates is both form and function, both old and new, memory and hope, practical and fanciful, grounded and enigmatic. Old stuff: piles of it. Machinery, pipes, tools, pots, all carefully and artfully arranged. Does he know where everything is, all the bits and pieces, hoses, connectors, springs, wires, bottles, cables, buckets, spades and wigwams for a goose’s bridle? Apparently, yes. A bricoleur artist, and a practical man, Turbitt reckons if he needs something to make something – whether a shed, a bed or a work of art, he knows where to find it amongst the trove collected in and around the mish-mash of buildings on his property. Actually, it’s not quite right to differentiate between his shed, his bed and his works of art. Everything Turbitt creates is both form and function, both old and new, memory and hope, practical and fanciful, grounded and enigmatic. Once you bump up over a railway line that is one of the old network criss-crossing Central Victoria, and head to the heart of Turbitt country, it’s difficult to know quite where to look in this paradoxical place. What do you call junk that’s arranged so practically and artfully? Is it raw material or is it already a thing? Always already art. Away off up a slope a little way, he’s built a concrete yurt, a hybrid garden folly with a low door, for meditation. There’s a hobbitish side to Turbitt, it seems, a surmise reinforced by the cubbyhouse intimacy of his dwelling. There’s also a round cave-like structure built into the side of a mound, what appears to be the former landholder’s idea of a bomb shelter. Or wine cellar. This area is Strangways, also known as Strangeways roundabouts, so could have been anything. There’s a hobbitish side to Turbitt, it seems, a surmise reinforced by the cubbyhouse intimacy of his dwelling, where grainy old wood and recycled everything creates a space that would not be out of place transported to a posh gallery in Fed Square. You’re not being invited to “explore, delve, conjure or reveal” but just to be and enjoy, which seems like an admirable reason for art to exist. The more portable of Turbitt’s art wins prizes because it’s so strong and individual, and it’s got the same intensely tactile quality as his lived-in and storage spaces. He likes to hang things, and to combine surfaces, so moulded concrete is stitched to a reed basket that encloses mud, with metal and feather adornments. The pleasure of symmetry is often upset by a swerve of line and a disruption of surface texture. It’s very involving art, which has been called whimsical because, I think, it has no intention to offend. When it works for a viewer, it’s possibly because it evokes that wonky but nice Nietzschean idea of the Eternal Yes. It’s art that embodies both a curiosity about what is in the world, and an acceptance that it’s all way beyond us. Paul Turbitt’s works are on show in the sculpture garden at Portal Gallery, Chewton in Central Victoria. What really get’s my goat (or should I say chèvre!) is the amount of these Bricoleurs coming over here and taking local Aussie handyperson’s jobs. Don’t get me wrong, I’m gunna vote for the Yes, and I’m even ok with intermarriage between Fromagers, but do they have to rub out faces in it? What happened to good, old fashioned Australian values? Great article Rosemary. A refreshing approach to Arts writing.